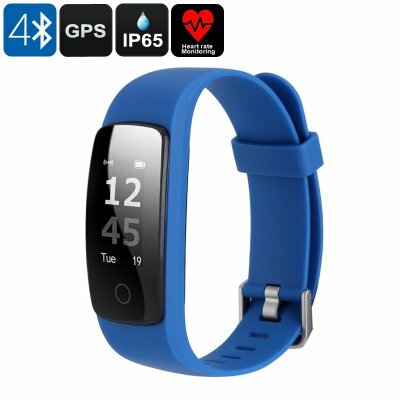 Successfully Added Bluetooth Fitness Band - 0.96 Inch OLED Display, Heart Rate Monitor, GPS Connect, Bluetooth 4.0, IP65, Sedentary Alert (Blue) to your Shopping Cart. With this stylish fitness tracker bracelet at your wrist, you’ll be working towards a healthier future and reach your upcoming workout goals in absolutely no time. Packing an abundance of high-end smart health and fitness features, this fitness tracker makes sure you get the most out of your upcoming workouts. The fitness tracker bracelet furthermore features an IP65 design, making it fully resistant against water, dust, and drops. Thanks to this, you’ll be able to use the fitness band in the toughest of environments and all weather conditions. With its built-in heart rate monitor, this sports wristband keeps constant and accurate track of your heart rate throughout the day. Providing you with high-end analysis on the current status of your heart rate, this fitness band is capable of giving accurate workout advice. Additionally, it can analyze the current fitness level of your heart and lungs and help you with guided breathing throughout your exercise sessions. With all these features at hand, you’ll be able to fully optimize your workouts. Thanks to its Bluetooth 4.0 support, this fitness wristband features ultra-fast data transmission speeds between your fitness band and smartphone. Compatible with both iOS and Android phones, this fitness tracker bracelet can be used with the vast majority of devices out there. With a 65mAh battery in place, you’ll be able to enjoy all its features for up to 15 days in a row and thanks to advanced message and call reminders – you’ll never miss an important update again.